Sue Galloway. Sue will be the case of the week for a few weeks (as has been the norm lately). You will be finding out what happens as we do. We are all subject to the effect of sunlight on our skin and we are being constant reminded that we should be careful not to "overdo" our exposure. The same is true of our pets. In particular white cats and cats with lots of white on their faces appear to have a high rate of sunlight induced cancer. The most common locations for the development of the tumors is by the nose and on the tips of the ear. These tumors are usually some variation of tumors of the skin. The are commonly "malignant" but don't usually spread through the blood or lymphatics early. Since the places where they occur are "out in the open" they are commonly detected before they have "spread". The do tend to extend beyond the visible borders so it is necesssary to take a "wide margin" to have a good chance of "cure". When it occurs adjacent to nostril we do usually remove the whole nose. While we hate to have to do such a thing we like being able to have the chance to cure a potentially fatal form of cancer. This is what Sue's nose looks like a year and a half after the surgery. We have been very pleased with this result. However, at the time that we did the surgery on Sue's nose we allso biopsied an abnormal ear margin. The pathology on the ear tissue came back as being inflammation . . . not "cancer". The spots continued to look strange so we biopsied them again about 3 months later with the same result. We treated the spots as inflammatory problems and did seem to have a good response. 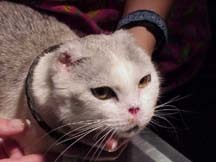 The owners brought her back around the first of Novemeber with both ear margins very inflammed and thickened. We started treatment with antibiotics and saw some improvement but the margins of the ear remained thickened. We are now faced with the possibility of a tumor being present in both ears. We might still be able to remove the tumors though we might have to be lucky for the tumors not to have "spread" by now. We did go ahead and biopsied the margins of the ear again on 11-22. It will take about 5 days to get the results of the biopsy. On 11-28 we got the lab report and the news is not what we wanted. The irratation of the ear did indeed turn out to be squamous cell carcinoma. The ears were operated on on Monday, 11-29. I'll have pictures up in the next few days. I was as aggressive as possible with the surgery without removing the ear canal. We are certainly not certain that we have gotten this problem resolved. However, Sue is having a little time away from the surgery table and is enjoying a good time. In this picture you can see that she has had some time to regrow hair and, despite what we might really like, spends her days sitting in the sun! We know that this might not be the best thing for the surgical site but we also know that she love the time she spend lounging around. Angie is holding her for this picture. Now this is a terrible picture of Mrs. Galloway but the most important thing of all is that Mrs. Galloway and Sue are able to enjoy each other every day. Sue couldn't ask to have a better owner when it comes to treatment or complience with our requests. We hate the fact that if we had been more aggressive early in the case we might have been able to do a better job of eliminating the cancer. We made the best decisions we knew to make but in the end we KNOW that we should have removed the tumor fromthe ear earlier. It's called monday morning quarterbacking but it's still the truth. 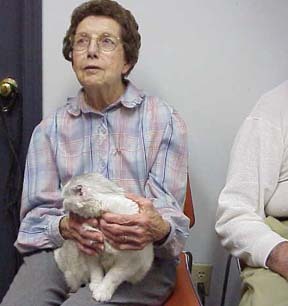 This is Sue in March of 2000. We are still watching with crossed fingers. We saw Sue again in late April. I'm not sure but I think we are still not "cured" of the cancer in the ears. The problem is very minimal in appearance . . . more like a mild ear infection. However, given our experience with Sue we believe that eventually this problem will spread. We are currently debating whether to put her through more surgery. Sue seems very happy and well adjusted at this time for which we are very thankful! In Medicine, perhaps more important to me in Veterinary Medicine, it is a "Law" that we ALWAYS lose in the end. None of us or our pets are immortal. 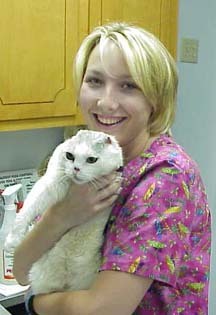 We lost a good friend in the fall of 2000 as Sue finally worsened and with great difficulty euthanasia was chosen rather than allowing her to suffer greatly. Her case will be one that I believe will always affect how I approach cases like hers. We miss her and miss seeing Mr. and Mrs. Galloway, her loving owners.